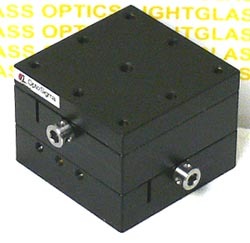 The OptoSigma 123-3390 40mm Two Axis Preset Dovetail Stage is a Set-and-Forget stage. Using a hex wrench to set the position on the dovetail X/Y stages and then using the locking screws to secure it in place makes this a great stage to use when setting up something that will be enclosed or difficult to reach when done. The 40mm square top is drilled for english fasteners. This stage is 30mm tall and is made primarily of brass.